Thomas Jansen Van DYKE (1580 – 1665) was Alex’s 12th Grandfather; one of 8,192 in this generation of the Shaw line. Thomas Jansen Van Dyke was born in 1580 in Holland, Reusel-de Mierden, Noord-Brabant, Netherlands. His parents were Jans VAN DYKE and [__?__]. He married Sytie DIRKS in 1604. He emigrated from Amsterdam to New Amsterdam in 1642. In 1661 he and his wife were enrolled as members of the Reformed Dutch Church in Brooklyn. He died in 1665 in New Utrecht (the last of six towns to be founded in what is today the borough of Brooklyn). Sytie Dirks was born in 1584 in Holland, Reusel-de Mierden, Noord-Brabant, Netherlands. Her parents were Dirck DIRKS and [__?__]. 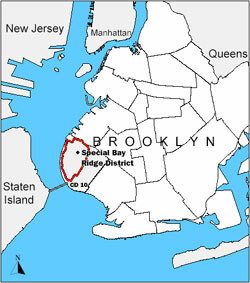 Sytie died between 1620 and 1679 in Brooklyn, Kings, New York. Thomas’ sons held farms at Yellow Hook, fronting on New York Bay in Brooklyn, and at New Utrecht. Bay Ridge, Brooklyn was originally known as Yellow Hook for the hue of the yellowish soil observed by the original Dutch settlers. This name was changed in 1853 after yellow fever struck the area and residents realized what an ill fit it was, given the circumstances. The new name was given due to the proximity of the neighborhood to New York Bay, excellent views of which were visible from the ridge that has now become Ridge Boulevard. Bay Ridge is in the southwest corner of Brooklyn bounded by Sunset Park on the north, Seventh Avenue and Dyker Heights on the east, The Narrows Strait, on the west and 86th Street and Fort Hamilton on the south. New Utrecht was the last of six towns to be founded in what is today the borough of Brooklyn in New York City. It was named after the city of Utrecht, Netherlands. In 1652 Cornelius van Werckhoven, a surveyor born in Utrecht and a principal investor in the Dutch West India Company, began purchasing land from the Canarsee and Nyack tribes. Upon his death in 1655 Jacques Cortelyou received permission to sell lots of the land to create a town. Twenty lots were laid out; Nicasius di Sille, an attorney from Arnhem in the Netherlands, was one of the first to purchase a lot and build a house using locally available stone and red roof tiles imported from Holland. He was employed as an advisor to Petrus Stuyvesant and as a “schout fiscal“, a combination of sheriff and district attorney. In 1660 di Sille’s List of the Inhabitants of Nieuw Amsterdam was completed at the behest of Stuyvesant. The names and addresses on the list correspond to the houses drawn on the Castello Plan. 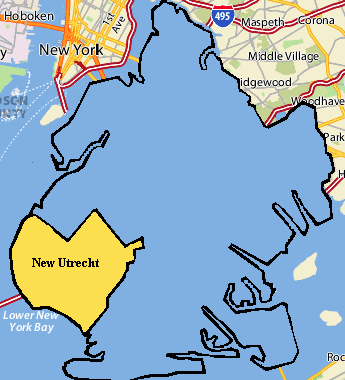 In 1657 New Utrecht was granted status as a village and received its charter in 1661, when the entire region was part of the Dutch colony of New Netherland. New Netherland later came under British rule in 1664 as the colony of New York. Jan’s second wife Tryntje Achias Haegen was born in 1618 in Reusel-de Mierden, Noord-Brabant, Netherlands. Her parents were Achias Haegen b. 1590 Amsterdam d. 1620 and Vronwtje Jans Oltmans b. 1580 Amsterdam d. 1 Apr 1646. After Jan died, she married on August 11, 1678 to Tileman Jacobsz Van der Hard, who came to America from Kamerik, Utrecht, Holland. Tryntje died in May 1695 in New, Kings, New York. Thomas’ son Jan Thomas Van Dyke was accompanied to the New Netherlands in 1652 by his second wife, Tryntje, and six children. on the good ship “De Bonte Kou” ( “The Spotted Cow”). 16 Jan 1657 – He was one of the founders of New Utrecht, where Director-General Peter Stuyvesant had permitted the establishment of a town, comprising about one thousand acres divided into farms of fifty acres each. Jan Thomasse Van Dyke was the owner of one of these farms and in 1659 added to it a tract of meadow land extending toward what is now called Coney Island. 16 Jan 1657 – The founders of New Utrecht were granted patents by the Governor and Council at Fort Amsterdam on were Jacques Cortelyou; the Lord Counsellor and Fiscal Nicasius de Sille ; Peter Buys ; Johan Zeelen ; Albert Albertsen (Terhune) ; Willem Willemse (Van Engen) ; Jacob Hellickers (alias Swart); Pieter Jansen; Huybert Hoock; Jan Jacobson; Yinker (or Squire) Jacobus Corlear; Jan Thomasse Van Dyke; Jacobus Backer; Rutgert Joosten (Van Brunt); Jacob Pietersen; Pieter Roeloffse; Claes Claessen (Smith) ; Comelis Beeckman and Teunis Joosten. Jan Thomas was active in the affairs of the Colony from the beginning, he soon received honors and appointments under its government. For many years he was a magistrate of Fort Orange and New Utrecht, and on 18 Aug 1673, was appointed by Governor Colve one of the schepens or judges. He died soon after, and his successor was named 16 Oct 1673. In 1675 his heirs sold at auction his old farm at New Utrecht for 2,500 guilders, and his two lots in the village to his son, Hendrick Janse, for 750 guilders. At the same time his new farm was sold for 2,000 guilders. Nicholas Thomasse Van Dyke is often listed as a son of the senior Thomas Jansen Van Dyke, but actually he was the son of Sgt. Jan Thomasse Van Dyke and the senior Thomas Jansen’s grandson. Nicholas was born 11 Aug 1669 in Brooklyn, Kings, New York. He first married Tryntje Rinerse Arends 20 Apr 1689 After Tryntje died, he married Fransyntie Hendricks 4 Jun 1692. He moved to New Jersey and finally to Delaware where his grandson played a key political role. Nicholas died 19 Nov 1729 in St Georges Hundred, New Castle, Delaware. Hundreds were once used as a basis for representation in the Delaware General Assembly, and while their names still appear on all real estate transactions, they presently have no meaningful use or purpose except as a geographical point of reference. Jan Thomasse’ great-grandson Nicholas Van Dyke (1738 – 1789) was an American lawyer and politician from New Castle, Delaware. He served in the Delaware General Assembly (1776-1777), as a Continental Congressman from Delaware (1777-1782), and as President of Delaware (1783-1786). He signed the Articles of Confederation for Delaware. In an attempt to solve one problem resulting from the war, Van Dyke proposed and carried out a plan to pay Delaware’s portion of the war debt. Another difficult unresolved war problem was the fate of loyalist Cheney Clow. Arrested in 1778, tried for and acquitted of treason in 1782, he was then charged with the murder of a member of the posse sent to capture him in 1778. Though there was no evidence that Clow actually killed the man, in May 1783 a jury convicted him and sentenced him to death. Unable politically to pardon Clow, but aware that many responsible people, including Caesar Rodney‘s brother, Thomas Rodney, believed the man innocent, Van Dyke postponed the execution indefinitely. Van Dyke returned to the State Senate for single session tenures in 1786/87 and briefly until his death in the 1788/89 session, when he was the Speaker. His son, also Nicholas, would later represent Delaware in the U.S. House and U.S. Senate. His New Castle home, now known as the Amstel House, still stands on Fourth Street in New Castle and is open to the public. Ann’s husband Nicholas Stillwell was born 1603 in Surrey, England. His parents were Nicholas Stillwell and Alice [__?__]. Nicholas died 28 Dec 1671 in Staten Island, New York. Nicholas went to Virginia around 1639 and moved to Manhattan Island in New York. He married twice, and died in 1671 in Staten Island, New York. By 1639, Nicholas Stillwell was well established as a tobacco planter on the York River between King Creek and Sandy Point in Virginia. For political reasons, Nicholas has left England for the new world in the year 1634-35. Records show that in the early 14th century, the Stillwells had “considerable estate” in the county of Surrey near Farnham, south of London. Because of the lack of protection from the Indians between the York and James Rivers at this time, it was necessary to have an armed force in constant readiness. Nicholas Stillwell was a Lieutenant in this army. There was also trouble with the Dutch over Fort Nassau. The Dutch had abandoned the fort, but when the Virginians occupied it in 1635, the Dutch attacked and recaptured it along with several prisoners including Lt. Stillwell. The prisoners were taken to New Amsterdam but returned to Virginia soon after. The Kent Island matter proved more serious. Kent Island, along with some other Virginia territory, was granted by the King to Lord Baltimore and included by him as a part of Maryland. William Claiborne, acting for the Governor of Virginia, was holding the territory. In 1635, a Maryland commissioner named Thomas Cornwallis swept the Chesapeake for illegal traders and captured one of Claiborne’s pinnaces in the Pocomoke Sound. Claiborne tried to recover it by force, but was defeated; although he retained his settlement on Kent Island. These were the first naval battles in North American waters, on 23 April and 10 May 1635; three Virginians were killed. The chaos of the English Civil War in the early 1640’s gave Claiborne another opportunity to reclaim Kent Island. The Calverts, who had received such constant support from the King, in turn supported the monarchy during the early stages of the parliamentary crisis. Claiborne found a new ally in Richard Ingle, a pro-Parliament puritan merchant whose ships had been seized by the Catholic authorities in Maryland in response to a royal decree against Parliament. Claiborne and Ingle saw an opportunity for revenge using the Parliamentary dispute as political cover, and in 1644 Claiborne seized Kent Island while Ingle took over St. Mary’s. Both used religion as a tool to gain popular support, arguing that the Catholic Calverts could not be trusted. By 1646, however, Governor Leonard Calvert had retaken both St. Mary’s and Kent Island with support from Governor Berkeley of Virginia, and, after Leonard Calvert died in 1648, Cæcilius Calvert appointed a pro-Parliament Protestant to take over as governor. The rebellion and its religious overtones was one of the factors that led to passage of the landmark Maryland Toleration Act of 1649, which declared religious tolerance for Catholics and Protestants in Maryland. Claiborne left Lt. Stillwell, who had served with him in the Indian Wars, in charge at Kent Island. Finally, the Governor, finding himself in an untenable position, ordered Stillwell to return. Stillwell refused and having liked what he had seen of New Amsterdam, decided to abandon his plantation and possessions in Virginia and go to New Amsterdam. This was 1645-46. Stillwell bought land on Turtle Bay but [today, midtown Manhattan where the UN is today, but then far from town] the Indian situation became so dangerous that he had to abandon it. He next settled at Gravesend [The only English chartered town in what became Kings County and was designated the “Shire Town” when the English assumed control, as it was the only one where records could be kept in English], where he bought a farm for his son, Richard, for 900 weight of tobacco. In 1659, he was elected Magistrate and served in this capacity for several years thereafter. In 1654, he was elected president of the Court Martial for trying pirates. In 1663, Peter Stuyvesant, Governor of New Amsterdam, engaged Lt. Stillwell as an officer to “assist in protection and security of the Province” requiring a “good and expert person speaking the English language”. Two officers, Stillwell and Capt. Marshall had been credited with ending the Indian War which doubtless influenced Governor Stuyvesant. Connecticut began to claim Long Island and sent a man named James Christie to stir up the people against the Dutch. Stillwell arrested Christie and returned him to New Amsterdam for trial. There was an attempt to hold Stillwell as hostage but he escaped. The unrest continued for a while. In 1664, English ships came into the harbor and captured New Amsterdam for England. Stillwell sold his plantation and bought another on the southeastern shore of Staten Island, where he died in 1671. He was survived by his wife, Anne and sons, Richard, Nicholas, Jeremiah and Joseph Stillwell. Imprimis, I give and bequeath my Soul into the hands of Almighty God who gave it, in hopes to be saved in and thorow ye Passion, merits and mediacon of Jesus Christ, my only Saviour and redeemer, and my Body to the Earth, to be Buried in decent and Christian like Buriall, according to the discrecon of my Executrix here after named. Item, I give and bequeath unto my youngest Sonn Jeremiah One Iron Gray Mare of about foure yeares old, to run upon the Island for his use. Item, I give and bequeath unto my welbeloved and affectionate wife Ann Stilwell, all my whole Estate, consisting of Land, Housing, Cattle, Corne, Oxen Kine, Horses, Mares, Sheepe, Swine, be they of what nature or kinde soever, As also all manner of Household Goods, moveables and immoveables whatsoever lying and being upon Staten Island aforesaid, or elsewhere, Together with all manner of Debts whatsoever, and of right belonging unto mee; And I do also hereby constitute and appoint my said wife to be my full and Sole Executrix of this my last will & Testament, revoking all wills and Testaments, by mee formerly made; In witness where of I have here unto set my hand & Seal the 22th daymof December in Anno 1671. His son, Nicholas Stilwell II, was a Captain in the militia in New York. He lived in Gravesend on Long Island, New York, when his father moved to Staten Island. He owned property at Jamaica, Long Island and may have lived there during his first marriage. He was married three times. In 1675 he became Constable of Gravesend. He also served as a member of the New York Colonial Assembly and as a magistrate. He died between Jan. 19, 1715, when he wrote his will, and March 5, when the will was proven. This entry was posted in 14th Generation, Immigrant - Continent, Line - Shaw and tagged Brooklyn, Fort Nassau. Bookmark the permalink. came to Westmoreland County, PA, then to Armstrong County, PA and married Anna Barbara Moyer around 1770. How Could Sytie have died in Brooklyn in 1620 and Ann be born in Staten Island in 1620, when the earliest recorded emigration to US was Hendrick in 1640? And Thomass Jan came over in 1652? I am looking for reliable sources to place Hendrick Van Dyke, of the Peachtree War, with Thomasse Jan Vandyke. Other sources have stated that this Hendrick belongs to another Van Dyke family. Thanks for the catch. This misinformation is repeated in many family trees. I have changed Sytie’s dod to between 1620 and 1679 and removed the place of Ann’s birth.